Keith Ross Miller was named after pioneer Australian aviators Keith and Ross Smith, whilst they were blazing their aerial trail from England to Australia in November 1919. No cricketer could have been christened more appropriately, for Miller was to take wings with the wartime RAAF, piloting the versatile Mosquito fighter-bomber in European operations while based in England. More importantly, he was destined to become one of international cricket's high fliers, a player as versatile as the aircraft he loved. A natural sportsman, he played Australian Rules football for St. Kilda and represented Victoria in 1946. Statistically, Miller never did himself justice. The record books do not remotely reflect the marvellous talent of a strokemaking, fast bowling all-rounder who might have earned his place in any team of any period for batting or bowling alone. "Nugget", so named after a London writer called him the golden boy, simply couldn't care less about statistics. First and foremost, he played for the joy of the game as a free spirit, indulging himself by hitting a huge six or delivering a frightening bumper with equal enthusiasm and purpose, but no semblance of ruthlessness. Miller started district cricket with South Melbourne as an early teenager whose Melbourne High School maths (and cricket) master was the much admired ex-Australian captain, Bill Woodfull. When Miller first arrived at South, club coach Hughie Carroll recalled: "He was so small you had to be careful not to tread on him, but he seemed to gain about ten inches in height between seasons and became a commanding batsman." 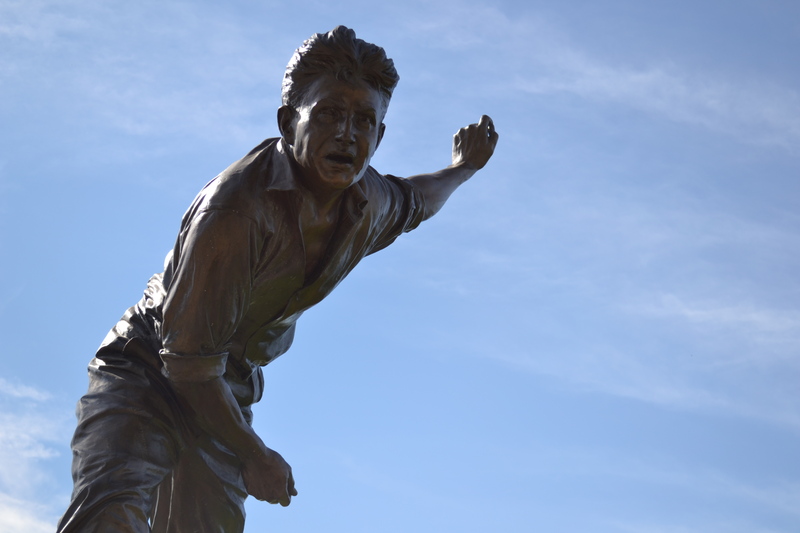 At 18, Miller made a debut 181 for Victoria against Tasmania and in 1939-40 confirmed his great natural ability with an MCG century against a South Australian attack headed by Clarrie Grimmett, then the world's wiliest spin bowler. War was at hand and this unlikely event was the catalyst for Miller's peaceful explosion on to the international cricket scene - and not only as a batsman. Before going overseas, Miller, an occasional "six o'clock bowler" in district cricket, made his first class debut with the new ball as a second innings stopgap for injured Maurice Sievers (Bradman's Xl v McCabe's XI) on the MCG in January, 1941, taking 1 for 24 from six overs. He surprised everyone with his pace and lift, including his victim, South Australian star Ken Ridings. Thereafter, Miller assumed his full potential as a bowler to be respected, if not feared. Between wartime duties in UK he played for RAAF sides against various RAF and Army combinations in 1943-44. In May 1945 peace came to Europe and the English public, starved of cricket for six years, was treated to some wonderful entertainment by the dashing Australian. His memorable 185 for The Dominions against England at Lord's was compiled at breakneck speed and the gentleman who repeatedly yelled: "Why don't they give James (Langridge) a bowl?" hopefully went home with a satisfactory reply from Nugget's bat as left-handed spinner Langridge was swept into or over the fence repeatedly by the rampaging batsman. Millermania swept through England. The tall, loose-limbed athlete captivated cricket lovers with beautiful batsmanship, unpredictably variable fast bowling, exciting fielding and a most transparent zest for the game - before, during and after the action. Miller was the immediate post-war sporting hero in England and his popularity at the home of cricket ensured a warm welcome and media attention for more than half a century after his first appearance at Lord's. His great form with bat and ball for the Australian Services Team in England, India and Australia during 1945 earned Miller a place in the Australian tour to New Zealand, where he made his initial test match appearance at Wellington in 1946. Against England in the following season Miller demonstrated his class before Australian fans in no uncertain manner, finished second to Bradman in the batting with 76.80 and second to Lindwall with the ball (16 wickets at 20.87). The figures, which would flatter a specialist batsman or bowler in any era, included a first test 7/60 at Brisbane and a brilliant 141 not out at Adelaide in the fourth test. Any appraisal of this wayward genius, however, would be a recollection of relatively rare but unforgettable 24-carat gems rather than the career necklace. As at Lord's, 1945, bowling for RAAF, when a fairly firm stroke down the wicket encouraged the batsman to move down the track looking for runs. With marvellous reflex and acrobatic agility Nugget soccered the ball to the other end, missing the run out by inches. The most knowledgeable scribe in the pressbox was constrained to say: "I'll bet he is a wonderful dancer too!" Miller was an elegant batsman, with tremendous driving power and equal efficiency off the back foot. It is certain that his deployment as a bowler affected his admittedly good batting average, but what a bowler! In the Lord's test of 1956 Miller, rising 37 years and minus his injured partner Lindwall, took five wickets in each innings (10 for 152 for the game), giving Australia its only win for the series. He was invited to lead the players from the ground and with a typically spontaneous gesture tossed a souvenired ball to a youngster in the crowd. In a flamboyant first class career spanning 22 summers Miller demonstrated on numerous occasions his ability to turn a game with dynamic batting or thunderbolt bowling. But he never departed from the personal principle that cricket was a hard but fair game - not an uncompromising international confrontation. A perfect illustration of a selfless sporting attitude that earned the affection of cricket lovers was his memorable innings against Essex, at Southend, during the triumphant march of the 1948 Australian tourists. With Australia 2 for 364 and heading for a record 721 for the day against a battered, demoralised attack, Miller, bored by the one-sided proceedings, was bowled for a first-ball duck. He said: "Thank God that's over" to the 'keeper and walked off. There is no question that he had thrown his wicket away as a merciful gesture, but Miller refused to answer any question on the matter. Retiring from international cricket in 1956, Miller was a special cricket writer for England's Daily Express for 20 years and then was engaged by Vernon's Pools, a Robert Sangster enterprise. Awarded an MBE for his services to cricket, Nugget's most cherished reward was Marylebone's commissioning of the Miller portrait now hanging in the Lord's pavilion. Sir Donald Bradman and Victor Trumper are the only Australians to be similarly honoured.